Comfortable holiday home with private pool and guesthouse near Fayence, Provence. Great pool side chill out area with tabels, chairs and loungers. The villa sleeps 8. The villa has a spacious living room with a comfortable seating area with fireplace. The large windows offer a beautiful view over the hills of the Provence. Double doors open to different terraces. There is an open plan, fully fitted kitchen with all necessary appliances including a large American fridge and freezer, dishwasher, microwave and also a cafetiere, ice maker, toaster and a fruit shaker. A staircase in the living room leads to a loft with TV corner. CDs, LP's and many family games are available. There are 4 bedrooms. The villa has 3 bedrooms, all on the ground floor. The guesthouse has one bedroom. Bedroom 1 is the master bedroom with en- suite bathroom (shower and toilet) and a double bed (180x200). Bedroom 2 has two single beds (2x90x200). Bedroom 3 has a double bed (180x200). These bedrooms are all on the same corridor. Bedroom 2 and 3 share a bathroom (shower). There is also a separate toilet. The 3 bedrooms in the villa are airconditioned. Bedroom 4 is located in the separate guest house close to the villa. The guest house is available on request at an additional charge (see price list). The guest house further includes a charming living room, a spacious bathroom with shower and a separate toilet. Furthermore, a kitchen with all necessary equipment. From the village of Fayence it's about 5 minutes drive to the villa. The last part on a private driveway between the fruit trees. There is plenty of space for parking several cars. On the covered terrace with patio doors you will find the outdoor dining table; a lovely place for lunch or dinner. A 2nd terrace is situated on the other side of the living room, also with an extendable dining table (10 people) as well as sun loungers. From here you have a beautiful view of the hills and the village of Fayence. From the villa you walk through a well maintained garden to the lower covered terrace with loungeset. This place is perfect to relax. From this terrace you walk further towards the heated swimming pool (12x5 m) with pool house. The pool has slightly salty water (no chloride). The pool house has a dining table for 8 people; running water and a refrigerator are available. There is a lounge by the pool with sun umbrella and luxury sun beds. Even with outside shower and toilet. Ample luxury sun beds . The guest house (20 meters from the villa) has a private terrace. For other entertainment, there is a jeu de boules course. 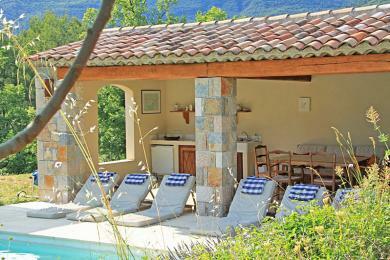 The villa is situated between the beautiful villages of Fayence and Seillans. Seillans is known as one of the most beautiful villages in the Provence. Both offer Provencal markets weekly. There is plenty of choice of good restaurants in the area. Also special is to buy wine and olive oil directly from local farmers. There are two supermarkets within a short distance of the villa. A supermarket called "8aHuit" in Seillans (3-minute drive from the villa) and a supermarket called "Super U" in Fayence (4 minutes drive). In the foothills of the Esterel Mountains, north of Fréjus-Saint-Raphaël, you can find the most beautiful areas in Provence. Here are the beautiful 'villages perchés', such as Fayence, Seillans and Mons. Medieval mountain villages, where you will find many remnants of the past. Montauroux and Callian are a good starting point for a family trip to the stunning Lac de St. Cassien. Strolling through pittoresque markets, you will experience the true beauty of Provence. Tourettes is best known for the Terre Blanche golf course. Due to its central location it is just a half hour drive to the coast in Cannes, Fréjus-Saint-Raphaël and the perfume town Grasse. Children are welcome. This is truly a family villa. The pool and spacious garden offer the perfect space for all kinds of delicious summer entertainment. In the pool house various pool toys are available. There is a welcome drink and the beds will be made upon your arrival. Information booklet available in the villa. Smart Start: There is a welcome drink and the beds will be made upon your arrival. Information booklet available in the villa. Pool: Private Pool size: 12 x 5 m.